Dr. Jason McGraw is assistant professor of history at Indiana University. He is the author of "The Work of Recognition: Caribbean Colombia and the Postemancipation Struggle for Citizenship" (University of North Carolina Press, 2014). Juan Valdez is mad as hell and he’s not going to take it anymore. Or at least, this is the case for his real-life Colombian counterparts. Under threat from death squads, criminal gangs, and U.S.-imposed free trade, rural communities across Colombia have again erupted in rebellion. 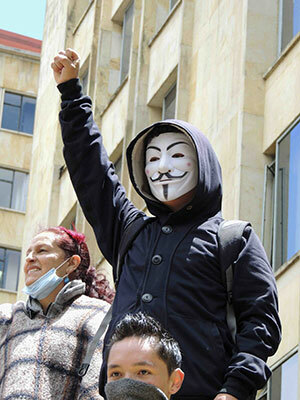 On April 28th, coffee farmers, potato growers, and other peasant groups launched a paro agrario (agricultural strike). Tens of thousands of peasant demonstrators have blocked highways, staged daily rallies in cities and towns, and chained themselves in front of the national Congress in Bogotá. University students, schoolteachers, and truck drivers have joined in with solidarity strikes. Popular violence and state repression have been acute, with hundreds of protestors and police injured or killed and travel advisories issued for the affected areas. The peasant movement’s main strike demands revolve around issues of economic security. Protestors have proposed new state subsidies for food crops, a refinancing of household debt, and the opening of new lines of interest-free credit. These demands come as peasant producers respond to new threats from neoliberal market reforms, including the U.S.-Colombia Trade Agreement that went into force in 2012. The more immediate cause of the April strike stems from the failure of the administration of Juan Manuel Santos to follow through on promises it made to end the agrarian strike of 2013. After more than two weeks of escalating protest, President Santos, who is currently seeking reelection, signed a new accord on May 13th with strike organizers in southwestern Huila. While the agreement brings a formal end to pickets in the region at the center of the strike, small producers in other parts of Colombia and workers in other industries have vowed to continue their protests. Organizers timed the paro agrario to force Santos into negotiations ahead of national elections on May 25th, even as the current strike follows a rising tide of mass demonstrations. According to a recent report by the Colombian Center for Research and Popular Education (Cinep), the more than 1,000 protests staged in 2013 represented the greatest number documented in the country since 1975. Cinep’s connecting of recent protests to the 1970s harks back to the height of the peasant movement. During that decade, a radical movement fought for the land rights of smallholders, although in recent years armed conflict, drug war violence, and state and paramilitary terror have undermined many of the gains from that era. Moreover, land reform has largely disappeared from policy discussions in tandem with the urbanization of Colombian politics. The 2013 and 2014 agrarian strikes are a clear attempt to regain lost ground and a forceful reminder of the continuing power of peasant protest. But today’s Rainbow Coalition-style rural crusade is a far cry from the peasant rebellion of the past. Unlike the class-based and often overtly Marxist orientation of 1970s organizing, the current mobilization proclaims its multiracial makeup. According to peasant leader Walter Benavides: “In the agrarian summit there are indigenous people and Afro-descended people who have been affected by the conditions in public order. They are, just like us, putting forward claims [to the state] but ones distinct from our agrarian strike.” The Congress of the Pueblos, which supports the paro agrario, calls for universal social justice, land access, and popular sovereignty, while also recognizing the country’s “culture” of “diversity” and specifically acknowledging a half-millennium of “indigenous resistance.” Other groups in the agrarian strike have made similar appeals for indigenous and Afrocolombian rights. This rhetoric of cultural difference has all but laid to rest the myth of the mestizo nation. The prevailing ideology across much of twentieth-century Latin America was that of nations founded on mestizaje, or racial mixture. The multicultural turn has undermined the dominance of mestizaje’s denial of racial difference. In Colombia, the turn arrived officially with the 1991 political charter, which for the first time in the country’s constitutional history explicitly recognized indigenous and black communities and vested them with rights. Official recognition only animated preexisting movements to press for more substantive social change based on racial distinctiveness. Multiculturalism has similarly disrupted the equation of the presumably class-determined peasant with a racially-mixed mestizo identity. Colombians no longer take as a given assertions such as those made in the 1950s by Colombian politician and scholar Otto Morales Benítez that the “hybridization of the race” produced the “mestizo [who] acted with the sense of possession of the land, of ‘his’ land.” Struggles for land in Colombia and across the hemisphere are increasingly interpreted as legacies of slavery or racial discrimination against Indian and African-descended people. Colombian observers now detail how rural indigenous and black communities have been targets of forced displacement and massacres in the country’s ongoing armed conflict. The current peasant movement has little choice but to acknowledge the multiracial nature of material struggles. Colombian peasant organizers’ attempts to reconcile collective economic rights with ethnic difference, however, mark the contradictions of the multicultural turn. As pointed out by Charles Taylor, there is a fundamental tension in modern efforts to assert both universal claims and cultural particularism. How generic “peasant reserve zones” are to be squared with the possibly competing interests of “indigenous ancestral territories” and “Afrocolombian collective territories” is rarely spelled out by movement leaders. In the long run, prioritizing between an ostensibly national right to economic security and the land claims of particular ethnic groups may prove unfeasible. The balance now often falls in favor of cultural rather than economic rights, although what concrete gains are possible from this form of recognition are debatable. This shift follows the noted global decline of social movements based around redistribution of material resources and the rise of new ones demanding standing premised on cultural difference. The menace of multiculturalism may be the very minimal cultural rights offered by nation-states that preclude more substantive demands for change. At the moment, Colombia’s agrarian movement is attempting to prove that struggles for economic and cultural freedoms need not be mutually exclusive. Whether Latin America’s peasantries are able to achieve a broad social security, which is far from given, it seems unlikely that their concurrent demands for recognition based on cultural distinctiveness will dissipate any time soon.